Three Figures, 1976 Colored pen and pencil on paper. Bequest of Pat O’Brien Parsons, class of 1951. Most artists discover their vocation in childhood. Inez Nathaniel Walker discovered hers in prison. She was serving a four-year sentence for manslaughter at the Bedford Hills Correctional Facility in Westchester, when she began doodling on the backs of mimeographed newsletters. An art instructor admired her work and sent it to Pat Parsons, a gallerist in Manhattan. Parsons was impressed, offering Walker encouragement and art supplies. The prisoner was 64 years old, with no previous art training. "Freehand: Drawings of Inez Nathaniel Walker" is at the Loeb Art Center of Vassar College until April 14. Born outside Sumter, South Carolina in 1907, Walker was part of the Great Migration to the North, fleeing the drudgery of farm labor. She settled in upstate New York and worked at numerous jobs: as a seamstress, in a pickle factory, as a cook. In 1971, she killed her abusive boyfriend with an axe. Though Walker served less than two years in prison, that time was transformative. She continued making art the rest of her life, until her death at the Willard Psychiatric Center in Ovid, New York, in 1990. Walker never used live models, though her work was largely portraiture. She drew images of personalities, not of faces. The heads of her subjects are enlarged, the hands small, though sometimes they are holding significant items like money, a drink, or a revolver. As with the Mona Lisa, there is a sensation that the portrait subjects are staring back at us. In 1973, the art collector Michael D. Hall interviewed Walker, asking if she had ever considered painting. "No, I don't want to try painting because I think it would just smear," the artist replied. The precision of the pencil satisfied her. 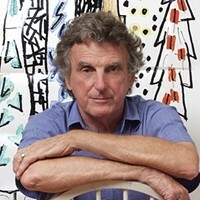 "Walker's graphic sensibility is completely unique," says Mary-Kay Lombino, curator of the show. "The way she draws every swirl of hair and every adornment to clothing and every eyelash; she developed her line on her own." Walker began her art career during the era of the Afro, which proudly proclaimed "Black Is Beautiful" while also suggesting a mystic aura around the human head. Walker was a master at depicting globe-like hair, even in her only known self-portrait, from 1973 (though the few photos we have of Walker show her hair straight). Most of the drawings have no titles, but there are exceptions. One piece was labeled Richard Nixon and changed to Bob Hope. (Apparently Walker drew portraits of people she saw on TV.) Many of her subjects smile benevolently, but not all. The eyes of Man with a Goatee are tinged with orange, giving him a fearsome gleam. 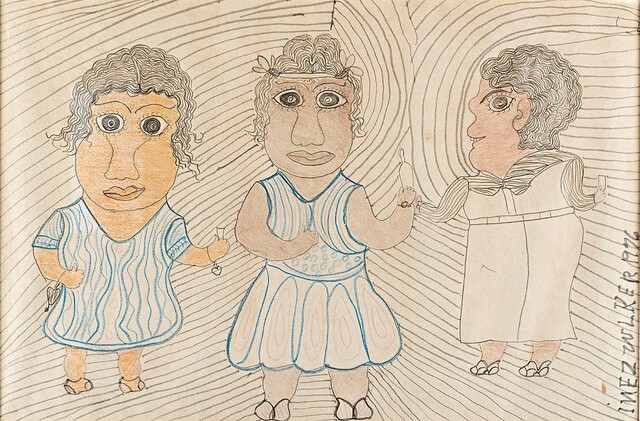 Though Walker's drawings have appeared in numerous exhibits of "outsider" artists and belong to at least 15 museum collections, this is her first solo show.